Silene spaldingii exists in only a few locations in the northwest corner of the state. Extant occurrences are known in the following areas: Tobacco Plains area, Lost Trail National Wildlife Refuge, the Niarada area and on Wild Horse Island. The majority of occurrences have less than 100 individuals, though 3 sites are each known to contain over 1,000 individuals and the total population size in Montana is likely 20,000+ mature plants based upon 2011 data. One historical occurrence exists from the Columbia Falls area. Several threats affect the long-term viability of the species in the state. Invasive weeds are the most widespread threat and are negatively impacting the bunchgrass habitat occupied by S. spaldingii. Housing development and subdivision are directly impacting populations in the Tobacco Plains and has the potential to further isolate known occurrences in the area. Cattle grazing is affecting several populations and two other occurrences have apparently been extirpated recently from the severe impacts associated with llama grazing. Fire exclusion and the successive build-up of litter compared to historical conditions appears to be having negative impacts on survival and reproduction. Populations are also at risk due to the small numbers of individuals and their isolated nature, which reduces the chances of cross-pollination and gene flow between populations. Long- and short-term trends are difficult to gauge due to the lack of survey and monitoring data. Estimates of trends and population size are also compounded by S. spaldingii plants exhibiting summer dormancy at rates that vary widely from year to year. Score1 - Moderate: Generally 10,000-100,000 individuals. 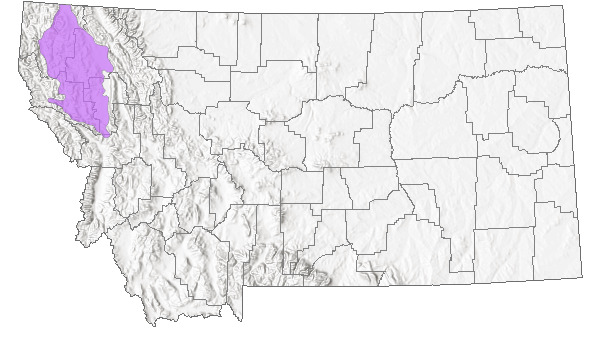 Score2 - Regional or State Endemic or Small Montana Range: Generally restricted to an area <100,000 sq. 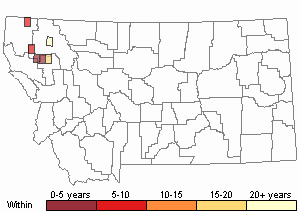 miles (equivalent to 2/3 the size of Montana or less) or Montana contributes 50% or more of the species’ range or populations OR limited to 2-3 Sub-basins in Montana. Score2 - Low: Generally occurring in 4-10 Subwatersheds (6th Code HUC’s). Score2 - High: Species is restricted to a highly specialized and limited habitat and is typically dependent upon unaltered, high-quality habitat (C Values of 8-10). Score1-3 - Declining: Species is likely declining though the magnitude of declines is uncertain. Declines may be based upon range extent and/or occupied area in the recent past (approximately 30 years). CommentTrends are not well-documented, though the species has experienced some declines in the state. Score2-3 - High to Very High. CommentDevelopment, invasive species and grazing are the primary threats. Score 12 to 15 total points scored out of a possible 19. Spalding's Catchfly is a perennial with a simple or branched rootcrown. There are 4-7 pairs of sessile, broadly lance-shaped leaves that are 6-7 cm long below and gradually reduced in size upward. Herbage is long-hairy and very sticky. There are few to many flowers in a leafy, somewhat open inflorescence. The tubular calyx is ca. 15 mm long, has 10 nerves on its surface, and is very sticky. The corolla has 5 separate, white petals, each composed of a narrow claw that is ca. 15 mm long expanding into a broadened blade above. Only the entire or shallowly-lobed blade with 4 tiny wings at the base protrudes beyond the mouth of the calyx. The fruit is a capsule that is 10-15 mm long and filled with numerous tiny seeds. Flowering in July and usually continuing through August. Dried flower/fruiting stalks are often visible into the Fall. This species can be distinguished from other perennial Silene spp. by its very sticky foliage and by its petals that are entire or only shallowly lobed. 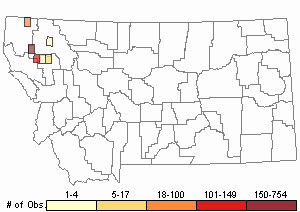 Regional endemic restricted to remnants of the Palouse Prairie grasslands of eastern Washington, northeastern Oregon, northern Idaho, and western Montana (barely extending into British Columbia, Canada). Open, mesic grasslands in the valleys and foothills usually with rough fescue, Nelson's needlegrass, Richardson's needlegrass and Idaho fescue. Occasionally with scattered ponderosa pine or broadleaf shrubs. Soils are usually deep and loamy. S. spaldingii typically occurs on northerly aspects and along draws and swales. 1. Reproductive Biology and Phenology: Silene spaldingii is a perennial herb capable of living at least five years (Lesica 1997) and is dependent solely on reproduction from seed. Flowers are perfect and protandrous (anthers mature, dehisce pollen and wither before the styles expand and stigmas become receptive) (Lesica 1993). This reproductive strategy limits, though does not exclude, self-pollination. Seeds apparently germinate in the spring and continue to grow while soil moisture is adequate and temperatures are moderate. Plants have been observed as early as May 22 at Dancing Prairie (Lesica 1997). Above ground parts of the seedling plants/rosettes dry up and are senescent during the hottest, driest parts of the summer. Plants may then revive with the onset of cool, moist weather in the fall (Lesica 1988). Flowering may take place during or after the second year with flowers developing in July and August. Each open flower persists for two or more days, and several flowers may be in bloom on the same plant allowing for pollination to occur from flowers on the same plant (geitonogamy). Individual plants flower for 2-3 weeks. Fruits of dehiscent capsules contain up to 150 seeds and mature primarily in August (Lesica 1993). Seeds require a short cold treatment for effective germination and may germinate in the fall as well as the spring following as little as four weeks of cold treatment (Lesica 1993, 1999). The pollination biology of S. spaldingii has been studied by Lesica (1993) and Lesica and Heidel (1996). In Montana, the only pollinators observed visiting S. spaldingii plants were bumblebees (Bombus fervidus). Studies of S. spaldingii pollinators in Montana are limited to the Dancing Prairie population. As noted earlier, self-pollination is possible, though Lesica's study (1993) showed very high levels of reduced fitness for progeny of close-pollinated flowers (bagged plants) versus open-pollinated flowers. 2. Species Ecology: Silene spaldingii occupies mesic sites within Palouse grasslands. Generally, plants are found on northerly aspects, in swales or along small draws where it is presumed more moisture remains available during the hot, dry summer months of July and August. S. spaldingii is atypical in that it flowers in July and August in a habitat when most other species have already completed flowering for the season. One potential advantage of this strategy is that it is not competing for pollinators. However, precipitation is usually scarce during this time period resulting in unfavorable soil moisture conditions for plant growth. Potentially in response to these dry conditions, S. spaldingii plants may remain dormant in some years. It is unclear if this dormancy is a response to the reduced moisture availability in the previous year, dry conditions during part of the current growing season, some combination of these or to some other factor (Lesica 1999, Lesica and Steele 1994). To date, a correlation between precipitation patterns and dormancy has not been made, though plants do apparently show a strong biennial periodicity (Lesica 1997). On-going demographic monitoring conducted by Lesica should help provide answers. Atwood, D., and N. Charlesworth. 1987. Status report for Silene spaldingii. USDA Forest Service, Intermountain Region, Ogden, UT. Not paged. Baldwin, C.T., and S.J. Brunsfeld. 1995. Preliminary genetic analysis of Silene spaldingii (Spalding's catchfly), a candidate threatened species. Wildland Plant Ecogenetics Cooperative, University of Idaho, in cooperation with Montana Natural Heritage Program. Not paged. Brooks, P. J., K. Urban, E. Yates, and C. G. Johnson, Jr. 1991. Sensitive plants of the Malheur, Ochoco, Umatilla, and the Wallowa-Whitman National Forests. U.S. Department of Agriculture, Forest Service, Pacific Northwest Region. Not paged. Caplow, F. 2002. Annual report for Spalding’s catchfly (Silene spaldingii) on Fairchild AFB, Washington. Washington State Department of Natural Resources, Natural Heritage Program, Olympia, Washington. 11 pp. + appendices. Gamon, J. 1991. Report on the status of Silene spaldingii Wats. in Washington. Unpublished report, Washington Natural Heritage Program, Olympia, Washington. 53 pp. Heidel, B. 1979. Endangered and threatened plants in the Northern Idaho BLM District. Unpublished report. 100 pp. Heidel, B., and P. Lesica. 1993. Conservation strategy for Silene spaldingii. Unpublished grant proposal prepared for The Nature Conservancy. 3 pp. Heidel, B.L. 1980. Silene spaldingii. Unpublished report. U.S. Fish and Wildlife Service, Portland, Oregon. 13 pp. Heidel, B.L. 1995. Preliminary status report for Silene spaldingii (Spalding's catchfly), a candidate threatened species. Unpublished report (draft) submitted to accompany Montana comments on the 1993 Federal Register Notice of Review for plants. Montana Natural Heritage Program, Helena, Montana. 10 pp. plus appendices. Hill, J. L. and K. L. Gray. 2004. Conservation strategy for Spalding's catchfly (Silene spaldingii Wats.). Idaho Department of Fish and Game Conservation Data Center, Boise, ID. 161 pp. Hitchcock, C. L., A. Cronquist, M. Ownbey, and J. W. Thompson. 1964. Vascular Plants of the Pacific Northwest. Part 2: Salicaceae to Saxifragaceae. University of Washington Press, Seattle. 597 pp. Hitchcock, C. L., and B. Maguire. 1947. A revision of the North American species of Silene. University of Washington Publications in Biology, Vol. 13. University of Washington Press, Seattle. 73 pp. Hitchcock, C.L. and B. Maguire. 1947. North American species of Silene. University of Washington Publications in Biology 13:28-33. Kagan, J. 1989. Draft species management guide for Silene spaldingii. Unpublished report to the Oregon Department of Agriculture, Wallowa Whitman National Forest. 13 pp. Kautz, D. R. 1981. Range and wildlife resources of Wild Horse Island, Flathead Lake, Montana. M.S. thesis. University of Montana, Missoula. 241 pp. Kruckeberg, A. R. 1961. Artificial crosses of western North American Silenes. Brittonia 13. 305-333. Lesica, P. 2004. Monitoring population trend of Silene spaldingii on Dancing Prairie Preserve 2004 progress report. Prepared for The Nature Conservancy. Helena, MT. 5 pp. Lesica, P. 1986. Monitoring of a population of the rare plant Silene spaldingii on Wildhorse Island. Unpublished report on file at the Montana Natural Heritage Program, Helena, MT. 3 pp. Lesica, P. 1988. A preliminary study of the pollination biology of Spalding's Catchfly in the Tobacco Valley, Lincoln County, Montana. Unpublished paper prepared for The Nature Conservancy, Montana/Wyoming Office, Helena, MT. 5 pp. Lesica, P. 1988. Germination requirements and seedling biology of Spalding's catchfly (Silene spaldingii). The Nature Conservancy, Montana/Wyoming Field Office, Helena, MT. 2 pp. Lesica, P. 1988. Monitoring Silene spaldingii on Dancing Prarie Preserve: 1988 progress report. Unpublished paper prepared for The Nature Conservancy, Montana/Wyoming Office, Helena, MT. 4 pp. Lesica, P. 1988. Monitoring Silene spaldingii on Wild Horse Island: 1988 progress report. Unpublished paper prepared for The Nature Conservancy, Montana/Wyoming Office, Helena, MT. 3 pp. Lesica, P. 1991. Inbreeding depression and the importance of pollinators to the threatened plant, Silene spaldingii (Caryophyllaceae). Unpublished report prepared for The Nature Conservancy, Montana Field Office, Helena. 15 p.
Lesica, P. 1992. Monitoring Silene spaldingii on Dancing Prairie Preserve: 1992 progress report. Unpublished report. The Nature Conservancy, Montana Field Office, Helena, Montana. 9 pp. plus charts. Lesica, P. 1992. Monitoring Silene spaldingii on Wild Horse Island: 1992 progress report. Unpublished report. The Nature Conservancy, Montana Field Office, Helena, Montana. 8 pp. plus charts. Lesica, P. 1992. The effects of fire on Silene spaldingii. 1992 progress report. Montana Natural Heritage Program, Helena. 14 pp. Lesica, P. 1993. Loss of fitness resulting from pollinator exclusion in Silene spaldingii (Caryophyllaceae). Madrono 40(4): 193-201. Lesica, P. 1993. The effects of fire on Silene spaldingii at Dancing Prairie Preserve. Unpublished report to the Montana Nature Conservancy, Helena, Montana. 14 pp. Lesica, P. 1994. Monitoring Silene spaldingii on Dancing Prairie Preserve: 1993 progress report prepared for The Nature Conservancy, Helena, Montana. 10 pp. Lesica, P. 1997. Demography of the endangered plant, Silene spaldingii (Caryophyllaceae) in northwest Montana. Madrono 44(4):347-358. Lesica, P. 1997. The effects of fire on Silene spaldingii at Dancing Prairie Preserve. Draft final report prepared for The Nature Conservancy, Helena, Montana. 27 pp. Lesica, P. 1999. Effects of fire on the demography of the endangered, geophytic herb Silene spaldingii (Caryophyllaceae). American Journal of Botany 86(7):996-1002. Lesica, P. 2003. Comments on the draft conservation strategy for Silene spaldingii from The Nature Conservancy of Montana - 11/15/2003. Helena, MT. 6 pp. Lesica, P. and B. Heidel. 1996. Pollination biology of Silene spaldingii. Unpublished report to the Montana Field Office of The Nature Conservancy. Montana Natural Heritage Program. Lesica, P. and E. Crone. 2004. Demographic monitoring of Silene spaldingii at four sites in Montana and Washington. 5 pp. Lesica, Peter and Dave Hanna. 2017. Monitoring Silene spaldingii Population Trends on Dancing Prairie Preserve, 2016 Baseline Final Report. January. Prepared by The Nature Conservancy, Choteau, Montana. Lichthardt, J.J. 1997. Revised report on the conservation status of Silene spaldingii in Idaho. Unpublished report to the U.S. Fish and Wildlife Service. Idaho Conservation Data Center, Boise, Idaho. 19 pp. plus appendices. Lorain, C.C. 1991. Report on the conservation status of Silene spaldingii in Idaho. Prepared for: Idaho Department of Parks and Recreation. Unpublished report on file at: Idaho Department of Fish and Game, Conservation Data Center, Boise. 29 pp. plus appendices. Mancuso, M., and R. Moseley. 1994. Vegetation description, rare plant inventory, and vegetation monitoring for Craig Mountain, Idaho. Unpublished report prepared for Bonneville Power Administration. 146 pp. Mincemoyer, S. 2005. Conservation strategy for Silene spaldingii (Spalding's catchfly) in Montana. Prepared for the U.S. Fish and Wildlife Service. Montana Natural Heritage Program, Helena, MT. 39 pp. + appendices. Morrison-Maierle. 1988. Draft Eureka airport master plan study: Chapter 5 - environmental assessment. 32 pp plus appendices. Pipp, A. 2015. Summary of work completed in 2015 on the Confederated Salish-Kootenai Tribal Land under a Natural Resource Collection Permit for Surveys and Monitoring for Spalding's Catchfly. Helena, MT: Montana Natural Heritage Program. 51 p.
Pipp, Andrea. 2018. Three-Year Baseline Monitoring Studies for Silene spaldingii on the Confederated Salish and Kootenai Tribal land: Year 2017. Montana Natural Heritage Program, Helena, Montana. Schassberger, L.A. 1988. Report on the conservation status of Silene spaldingii, a candidate threatened species. Montana Natural Heritage Program, Helena. 71 pp. Siddall, J. L., and K. L. Chambers. 1978. Status report for Silene spaldingii. Oregon Rare and Endangered Plant Program, Lake Oswego, OR. Not paged. U.S. Fish and Wildlife Service. 1998. Endangered and threatened wildlife and plants; 90-day finding for a petition to list Silene spaldingii (Spalding’s catchfly) as endangered or threatened. Federal Register 63(220): 63661-63662. U.S. Fish and Wildlife Service. 1999. Endangered and threatened wildlife and plants; proposed threatened status for the plant Silene slapdlingii (Spalding's Catchfly). 50 CFR Part 17. Federal Register 64(232):67814-67821. December 3, 1999. U.S. Fish and Wildlife Service. 2001. Endangered and threatened wildlife and plants; Final rule to list Silene spaldingii (Spalding’s catchfly) as threatened. Federal Register 66(196): 51598- 51606. Watson, S. 1875. Revision of the genus Ceanothus and descriptions of new plants, with a synopsis of the western species of Silene. Proceedings American Academy Science 10:333-350. 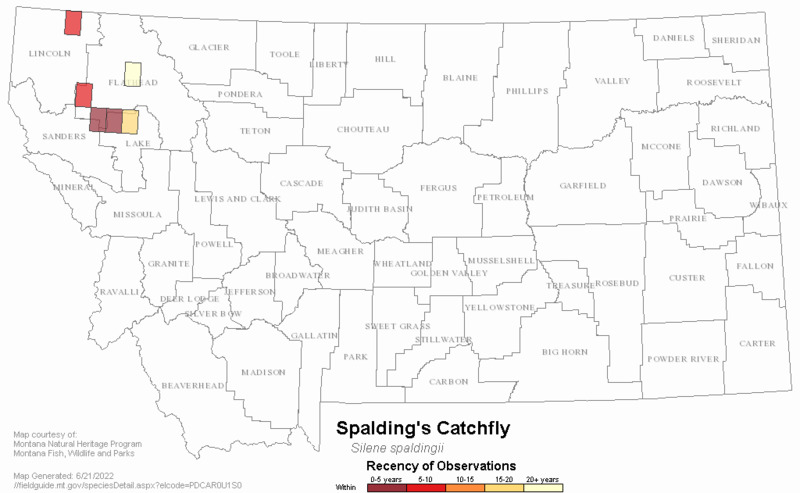 Web Search Engines for Articles on "Spalding's Catchfly"